If you own a Toyota, we know you may have some concerns about the recent recall from last year. The following videos will provide you with additional information on the recall itself and the repair work that will be performed by Toyota to remedy the problem. On Stopping Procedure This video shows what to do in the event you experience a sticking accelerator pedal while driving. This is the proper procedure recommended by Toyota for bringing your vehicle to a safe stop. The Recall Repair Work This video shows the work that will be performed on a Toyota with a sticking accelerator pedal. Toyota and Lexus maintenance is necessary to protect your investment. If you own your Toyota or Lexus, regular Toyota or Lexus maintenance helps increase its resale value. If you're required to maintain your vehicle, why not trust your Toyota or Lexus to those who know it best – the technicians at Orr Automotive. Most of the years we've been in business we've specialized in foreign automobiles, so we know what it takes to diagnose a problem with your Toyota or Lexus and repair it. We're Toyota and Lexus repair experts. Taking an active role in the maintenance of your Toyota or Lexus is necessary in order to protect your investment. Proper maintenance will help extend the life of your Toyota or Lexus and preserve its value. Regular maintenance will also help you avoid costly repairs down the road as well as optimize your car's performance, safety and fuel efficiency. There are factory-recommended service intervals for your Toyota or Lexus. Relying upon these intervals will only help you get the minimum life out of your car. Driving conditions in Montclair area, as well as your individual driving style, should dictate how often you perform the routine maintenance on your Toyota or Lexus. Repairs can often be avoided, andOrr Automotive is well-equipped to advise you on the best maintenance schedule for your Toyota or Lexus. For expert Toyota or Lexus repairs in Claremont, Montclair or Upland, call Orr Automotive. A great number of people think you must have your Toyota or Lexus service done at a dealership, otherwise you will void your new car warranty. This is not true. They also believe that if the dealership technicians are working on Toyotas all day long, they should know what they are doing. This is not always the case either. Trust your Toyota or Lexus repairs, Toyota or Lexus service, and Toyota or Lexus maintenance to the experts at Orr Automotive. We've not only worked on countless foreign cars during our business lifetime, we care about the safety and reliability of your car. 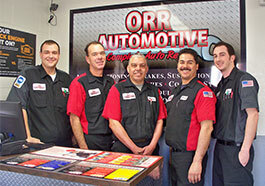 When it comes to servicing your Toyota or Lexus, contact Orr Automotive.